This article explains the Critical Path Method (CPM), developed by Morgan R. Walker and James E. Kelly in a practical way. After reading it, you will understand the basics of this powerful project management tool. 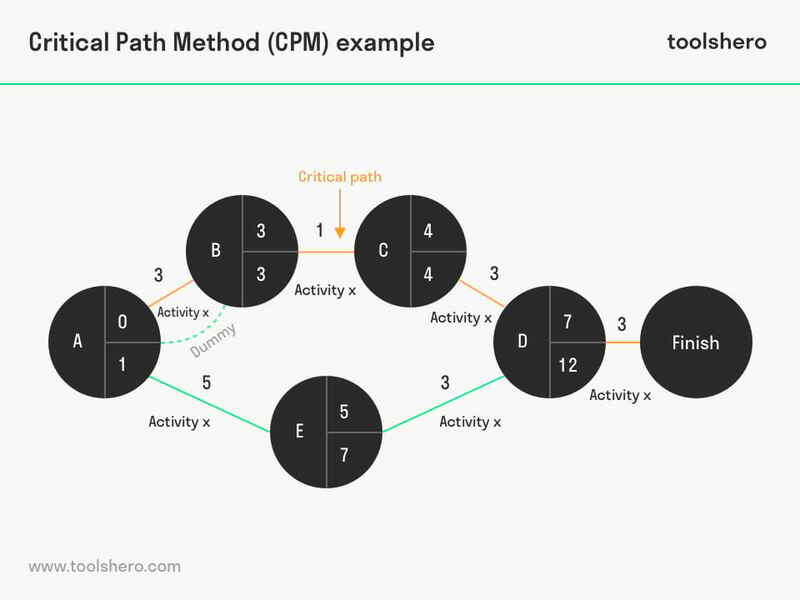 What is the Critical Path Method (CPM)? Time is money, that’s why it’s good to know what the duration of a project is with the least amount of slack possible. That’s where the Critical Path Method (CPM) or Critical Path Analysis comes in. By calculating the so-called ‘critical path’, you can make a tight schedule, and the risk of delays is reduced to a minimum, thanks to insight into all subprocesses of the project. Critical Path Method or CPM is project modelling technique that was developed by the American entrepreneurs Morgan R. Walker and James E. Kelly in 1957. They developed algorithms for a large project at the American company DuPont. In 1959, they published an article about scheduling critical paths. Finding a critical path in a project gives insight into the path with the longest duration. The longest duration determines the total duration of the project, and that’s why it should have as little slack or float as possible. At first, they worked with complex computer systems. These days, CPM systems are available as software. It’s however still possible to find the critical path manually by writing out a network chart. Critical Path Method or CPM is used all over the world by project planners to create project schedules for all kinds of projects, including ICT, research, and manufacturing. In construction as well, CPM is a useful tool to find the critical path in addition to a network chart. Network charts are the foundation to get started with CPM. It is a visual representation of all planned activities and times of large and complex projects with many subactivities. It is characterised by many activities being carried out simultaneously, but also that activities follow each other sequentially, and are dependent on the delivery of the prior one. When constructing a new residential neighbourhood, the foundations can only be laid after the soil has first been remediated, and the sewer system has been constructed underground. Piles are driven in as the foundation is being built. All these activities and their congruence and interdependence can be visually represented in the network chart. After that, the critical path can be determined using Critical Path Method or CPM. There are rules that have to be followed when drawing up a network chart. First, it should become clear which activities will be part of the project. By carrying out a structural analysis, the order and interdependence of the activities is made clear. After that, a schedule is used to calculate the duration per activity, after which the chart can be drawn up. Generally, this is automatically done by software programs. If it’s done manually, it’s good to know that you can only use straight lines that can’t cross. The lines connect two different nodes. One side of the line shows the activity, the other duration of that activity. The nodes are drawn as circles and connect the different activities. A dummy activity can be entered to ensure a proper flow in the duration. Such a dummy is drawn as a dotted line and can be a full or a half moon. The critical path itself indicates the duration, with no to the least possible delay. It’s represented by a bold, double, or coloured straight line in the network chart. The nodes don’t just connect the activities. They also give information about the earliest possible start time of an activity and the latest possible start time. A single glance will show the interdependence of the different activities and the possible delays on the critical path. Each complex project that can be drawn using a network chart has to meet a number of conditions. For instance, there should at least be a clear start and end point for the project. It should also be a unique and one-time project with an end result that has been determined in advance. In order to calculate the duration and the critical path, all subactivities have to be considered that will be carried out simultaneously or in order. A final characteristic is the fact that the project uses a multi-disciplinary approach with different types of expertise. There are a number of advantages to working with Critical Path Method or CPM. First of all, the critical path can identify and provide insight into activities that have to be completed in time in order to deliver the entire project on time. The critical path uses this to show which tasks can be postponed without influencing the general project schedule. That’s because it calculates the least amount of time necessary to complete the entire project, and it shows both the earliest start date and latest end date for each activity. 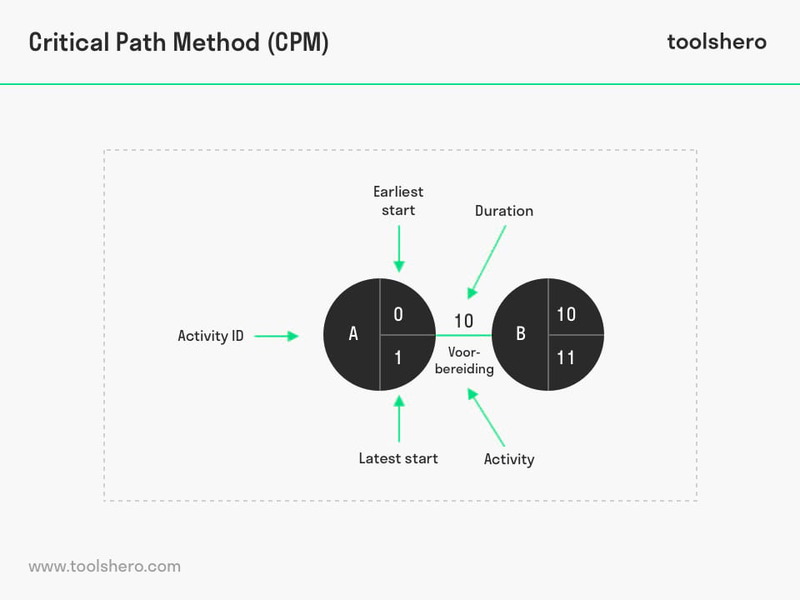 In order to provide insight into Critical Path Method or CPM, it’s a good idea to work according to a step-by-step plan. Below the 5 steps are described that lead to the critical path. As indicated before, all subactivities first have to be identified that will be carried out during the project as a whole. When building a new residential neighbourhood for instance, you need to remediate the soil, drive in poles, build a sewer system and foundation, pour concrete, carry out masonry, construct cavity walls, install sills, do roofing, wire for electricity, and so on. It’s a good idea to only include the most important activities in the network diagram to keep it clear. During this step, it’s determined if there’s interdependence between the subactivities and if certain activities can be carried out simultaneously. The order of the sub-activities is determined in this step. For instance, you can’t start on the roofs of the houses until the top floors have been finished. Electricity, gas, and water pipes, on the other hand, can be installed simultaneously. The expected duration is now determined per activity. With all the information that has been obtained, the network diagram can be drawn up following the rules described above. During the last step, the critical path can be determined. It’s important to know the earliest starting moment and the latest possible delivery date for each activity and include this in the calculation. The critical path makes clear which range of activities will have the longest duration. A delay in one of these activities will result in a delay for the project as a whole. In CPM, such a delay is also called ‘float’. The time between the earliest and latest possible start time or the earliest and latest possible delivery time is the slack in the critical path. Only within this duration, can an activity be postponed without the whole project getting delayed. That means the critical path is the longest path in the network diagram. What do you think? Is the Critical Path Method / Analysis applicable in your daily work? Do you recognize the practical explanation or do you have more suggestions? What are your success factors for scheduling and managing critical paths within a project or multiple projects? Kelley Jr, J. E., & Walker, M. R. (1959). Critical-path planning and scheduling. In Papers presented at the December 1-3, 1959, eastern joint IRE-AIEE-ACM computer conference (pp. 160-173). ACM. Willis, R. J. (1985). Critical path analysis and resource constrained project scheduling—theory and practice. European Journal of Operational Research, 21(2), 149-155.